When Is Easter Sunday 2018? 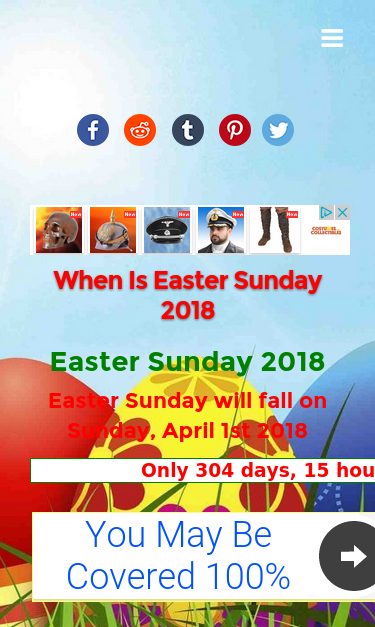 Easter Sunday 2018 or simply Easter 2018 will fall on April 1st in the year 2018. Learn When Easter Sunday Is In Other Years. Find more information about Easter Sunday, The Easter Bunny, and Easter Eggs. Your webpage has 6 'img' tags and none of them contain the required 'alt' attribute. Your webpage is using 6 inline CSS styles! Uncaught TagError: adsbygoogle.push() error: All ins elements in the DOM with class=adsbygoogle already have ads in them. Source file: http://pagead2.googlesyndication.com/pagead/js/adsbygoogle.js at line: 13, column: 674 Uncaught No element defined. Congratulations! The size of your web page's HTML is 7.14 Kb and is under the average web page's HTML size of 33 Kb. Your HTML is compressed from 21.72 Kb to 7.14 Kb (67 % size savings). This helps ensure a faster loading web page and improved user experience. Your site loading time is around 2.633 seconds and this is under the average loading speed which is 5 seconds. Your site is not using expires headers for all of your images. An expires tag can help speed up the serving of your webpages for users that regularly visit your site and see the same images. Learn more about how to add expires headers to your images.